Slice a turnip into fry-like strips. Thinner is better IMO. 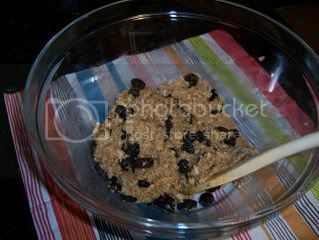 Spread on a cookie sheet or baking pan. Drizzle with olive oil, sprinkle with chili powder and salt to taste. Cook at 400 degrees for 10 minutes, flip fries, bake another 5 minutes. These are very tasty, but keep in mind they won’t get crispy like real fries (at least in my experience). I think there’s too much moisture in the turnip. Similar to above, but cut the sweet potato into thin slices and omit the chili powder. Cook until crispy. We used olive oil and substituted a mix of spices (thyme, sage, rosemary?) for the poultry seasoning, which we didn’t have on-hand. We also chopped up some almond slices and added that to the crust for a nice crunch. Stir in tomatoes and mix well. In a small bowl, stir together coconut milk, arrowroot powder, and salt until smooth. Gradually stir coconut milk mixture into skillet. Stir in Red Pepper and bring to a boil. Reduce heat to low. Simmer 5 minutes or until slightly thickened, stirring frequently. 1. Heat nonstick pan to medium-high, spray with Pam spray, and sautee pineapple ’til lightly brown in some spots. Take out of the pan and set aside. Go ahead! Eat one; they’re yummy. But just one. 2. Heat 1/2 teaspoon of the oil in the same pan, then sautee almond slivers ’til lightly browned. Remove from pan and set aside. Same rules re: tasting apply. Cook ½ lb. meat of choice (ground pork, turkey, turkey sausage, bacon, etc). Sauté one half to a cup of veggies of choice such as mushrooms, white onion, red bell pepper, spinach or scallions. Set aside. Whisk 6 eggs and 1 cup almond milk, and pour into lightly greased muffin tins. (Use foil cups if desired.) Add meat and veggie blend to each cup of egg mixture. Bake at 325 degrees Fahrenheit for 25-30 minutes or until golden brown. These can be stored in the fridge until they are ready to be eaten. *I used 1lb ground beef, 1lb ground turkey. It was so good! It makes a ton, so you can freeze some for a quick meal later on. *This was really good, but spicy. I think next time I might cut out the jalapeno or not use as much (I can’t really handle spicy things). *These are REALLY salty. I actually threw out the first batch because they were so salty and inedible (in my opinion). I made them again without any salt and they were really good! So just beware of the salt :). Clean all vegetables, slice peppers approximately 1″ from tops and save tops. For miniature peppers, slice closer to the top. Clean out seeds and membrane from the inside of the peppers, then rinse. Grate cauliflower coarsely, and microwave for 1.5 minutes (if you’d prefer, you can add it earlier on in the sauteeing below in place of microwaving*). Cook turkey in a skillet on medium heat, and add Montreal steak seasoning, salt and crushed pepper to taste. Once turkey has cooked through, remove from heat and set aside in a bowl. Add in cauliflower rice, then turkey and stir for 2-3 minutes before removing from heat. Allow mixture to cool a few minutes. Scoop turkey mixture into peppers, re-cap, then brush the outsides lightly with olive oil. 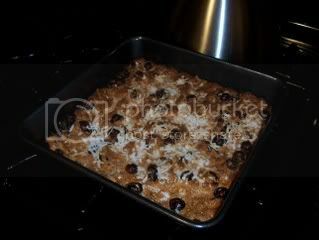 On a cookie sheet, toast nuts and shredded coconut until golden brown. In order for them to cook evenly, you need to shake up the tray at least once during cooking…trust us! Once toasted, pour mixture into a food processor and pulse until nuts are chopped and the mixture becomes coarsely ground (sort of the consistency of bread crumbs). In a mixing bowl, melt coconut oil and almond butter (about 30 seconds). Remove from microwave and stir until smooth. Add vanilla extract, honey and sea salt. Mix thoroughly. Fold in nut mixture, almond meal and protein powder until mixed thoroughly. Add whole egg and mix thoroughly. Press mixture into an 8 by 8 loaf pan (a modification that we made to keep everything crisper and help the bars to hold together). Cook in a preheated oven at 325 degrees for 10 minutes. Remove from oven, sprinkle a ¼ cup of shredded coconut on top and place under broiler until top begins to brown. Let cool for 10-15 minutes. Cut into 12 pieces/bars. Enjoy or stack on wax paper/parchment and store in an airtight container. Note: You can also add dark chocolate chips instead of the cranberries/blueberries (available at Whole Foods or health food store). If you add the chips while the mixing bowl is warm (from the coconut oil/almond butter mixture), they will melt into the mixture and you will have yourself a chocolate primal bar. Alternatively, you can just let the mix cool, then add the chips, then refrigerate the pan to get chocolate chip primal bars. The bars stick together pretty well without being cooked. And, for those of you who feared they would eat the whole pan… the total nutritional breakdown for the whole darn lot! Paleo BBQ sauce – this recipe is pure gold. Paleo Hot Greens with Bacon. Lastly, this is the BEST coconut oil. The only problem is the shipping so if you go in on it with a bunch of peple and order the 1 gallon jugs, it is totally 100% worth it.